In recent years, Shimenzhai Primary School in Haigang District of Qinhuangdao City has established a copper-imitation painting creation community based on the advantages of regional tourism resources, made great efforts to create fine courses on campus, and promoted the effective integration of school-based culture and local tourism culture. 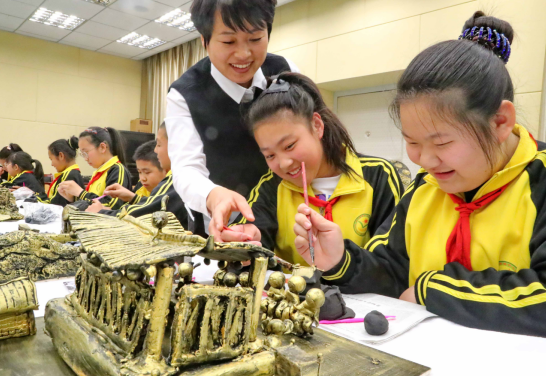 It is reported that using waste foam and ultra-light clay, the teachers instructed students to make copper-imitation three-dimensional models of scenic spots such as the Site of Qin Shi Huang Seeking Immortality into the sea, Laojunding, and Pigeon Nest Park, etc.. By instructing students to do so and explaining the historical background of regional tourist attractions, teachers showed China's thousands of years of practical and decorative cultural features, reproduced the artistic charm of the ancient and complex copper engraving to students, and guided students to learn traditional cultural knowledge in community activities, so as to let them know the beauty of our hometown, understand her history, inherit the tourism culture, and gain real experience in learning history and culture. The copper-imitation painting is an form of artistic presentation integrated with painting, clay sculpture and engraving, which is coated with black pigment after being sculptured on a thin wooden board using ultra-light clay, and painted with metallic acrylic color after drying.